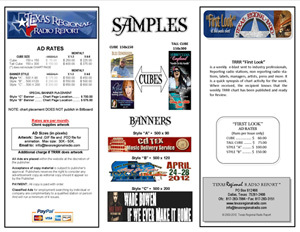 If you would like to advertise within this TexasRegionalRadio.com site, call us for any advertising specials which could be in effect. Contact us at 817-283-7984 or via email at dave@texasregionalradio.com or sales@texasregionalradio.comto request a brochure. NOTE: Advertising within this site DOES NOT GUARANTEE or CONSTITUTE any promise of chart positions! Any advertising in this site is at the desire of the advertiser and is considered as a tool of marketing to inform the TRRR viewing public or industry persons of the artist product or career activities.